COLUMBIA, S.C. (AP) — After spending years fighting to keep drones from flying over prisons, South Carolina corrections officials unveiled plans on Thursday to use the small unmanned aircraft to keep a remote eye on inmates, an effort they said is the first of its kind in the country. Corrections Director Bryan Stirling showed reporters new drones that can be used to monitor a prison and the area outside, where contraband such as cellphones and drugs can be launched over walls. The agency has hired two pilots, both military veterans, who will travel among the state’s 21 prisons and monitor them from 400 feet in the air using remote controls and video screens. It’s something Stirling said the state Corrections Department has already been doing for several months, at little additional cost to the cash-strapped agency. 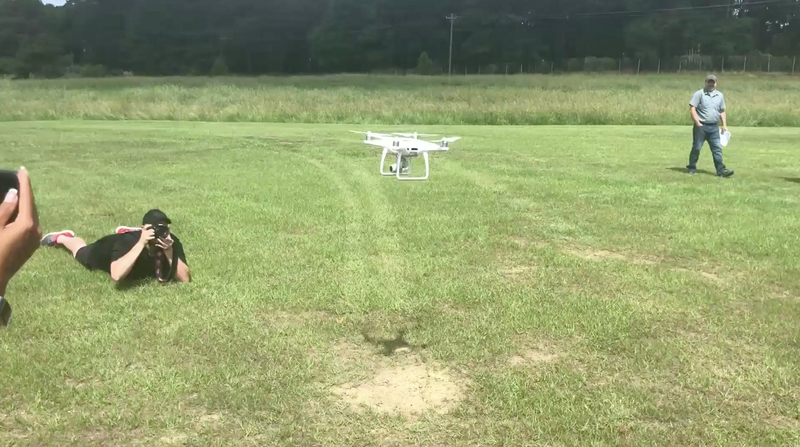 And, according to Stirling, South Carolina is the first state in the nation to use drones like this, with the director saying that officials with the Association of State Correctional Administrators have told him they weren’t aware of it happening in other places. Drone test in South Carolina. The group didn’t immediately respond to a message Thursday seeking more information about the effort. Drones have been an issue at South Carolina prisons for some time, although it wasn’t the agency using them. Use of the devices has increased as a way to deliver contraband to prisons across the U.S.
Several recent instances in South Carolina illustrate the problem. In May 2017, two men were arrested for trying to fly knives, marijuana and phones into a medium-security state prison. Another man is serving a 15-year sentence after officials found a crashed drone outside a maximum-security institution in 2014. Last summer, when an inmate escaped from a maximum-security prison, officials said he had used wire cutters possibly delivered by drone to cut his way through multiple fences. This year, prison officials got South Carolina lawmakers to pass a ban preventing private drones from flying over prisons, and some institutions have installed drone sensors that can alert officials if any are nearby. But now, Stirling said he’s using the technology to his agency’s benefit, giving officials a bird’s eye view of what’s happening on the ground. “No one will even be able to know we’re up there, because it’s pretty high up,” Stirling said Thursday, as the drone pilots demonstrated the devices. Set up in a field at the agency’s Columbia headquarters, the white craft’s four propellers began to whirr before it shot several hundred feet straight up into the air, hovering above a small crowd of reporters and agency officials. Via their remote control, the pilots maneuvered the drone along a road from the headquarters’ entrance, showing reporters the crisp clarity of images from hundreds of feet up. The drone cameras have heat-sensing and night-vision capability, officials said, meaning that they can detect when someone is or has recently been in a prohibited area, potentially trying to smuggle a package over a prison fence late at night. If they see something suspicious, the pilots can alert officers at the prison to investigate on the ground. In addition to keeping out contraband, officials said the drones will help them keep an eye out for any outbursts of violence on sprawling prison complexes. That could potentially help squelch riots before they get out of control, like the deadly insurrection in which seven inmates died earlier this year at a maximum-security South Carolina prison. “I think you’re seeing the future of corrections, right here,” Stirling said.